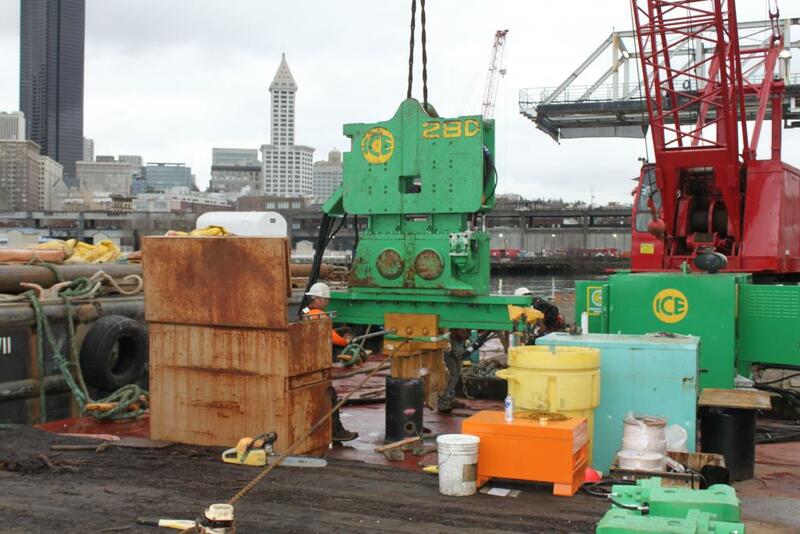 Seattle T-46 Barge Refloat & Fender Piling Repair Project - Global Diving & Salvage, Inc.
Seattle’s most extensive civil works project, the Alaskan Way Viaduct replacement tunnel, is being constructed using the world’s largest tunnel boring machine, ‘Bertha’. Due to the construction site’s close proximity to the waterfront, the dirt and rock spoils from the dig are transported out of the tunnel via conveyor belt to Pier 46, then loaded onto barges for transport. Progress was halted early one morning when the barge holding the spoils began to list, then capsize. 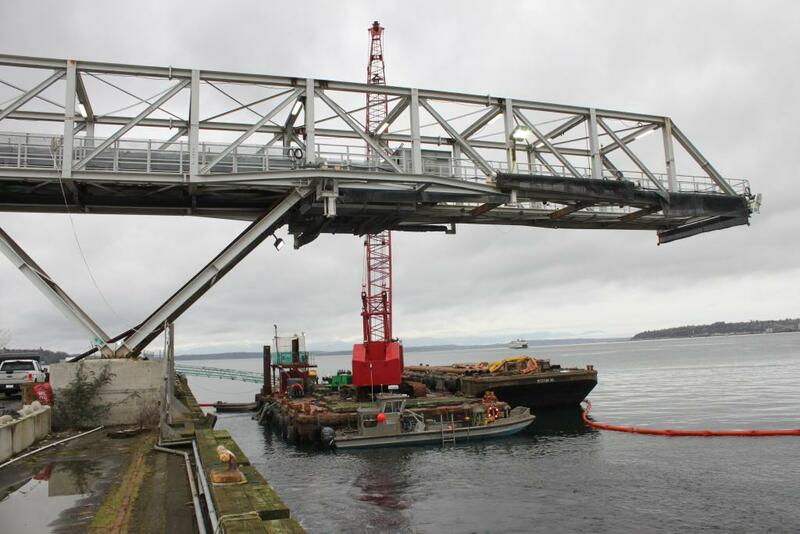 Tunneling operations were halted due to the partially capsized barge at the adjacent pier and an impending rising tide. Project personnel called Global’s 24-hour number to request immediate assistance. Global dispatched a Salvage Master who was on scene within 30 minutes of the call. 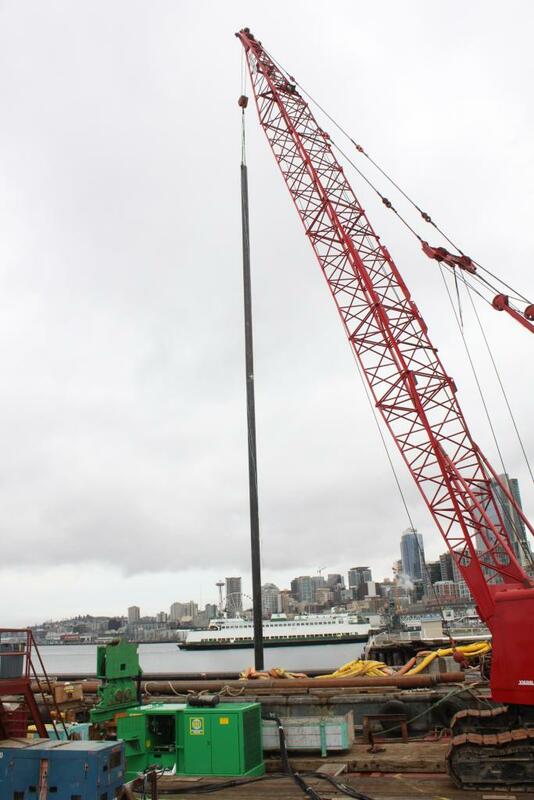 Global moved the unstable barge from underneath the pier and conducted a full salvage assessment, including analysis of the barge’s stability and an underwater survey. The spoils had shifted on the barge causing it to list heavily to one side. Global developed a lightering plan and engaged a crane barge with a clamshell bucket to transfer the loose spoils to another barge. 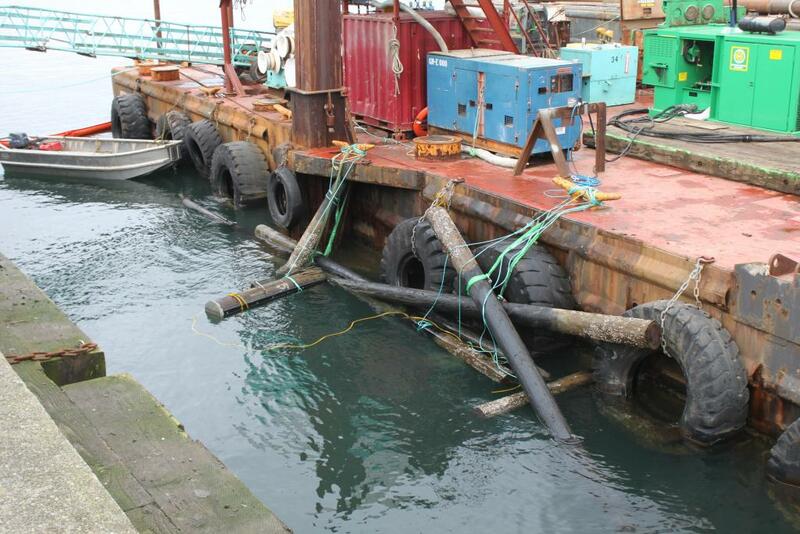 Global positioned high-capacity pumping equipment on location as a precaution against the barge taking on more water. Draft measurements monitored throughout the lightering indicated the presence of an unbalanced load in the barge, and significant damage to the barge was observed. This information was incorporated into the lightering plan to ensure the safety of the operation. Once the spoils were removed from the barge, Global removed the damaged bin rails and prepared the barge for transit through the Ballard Locks. 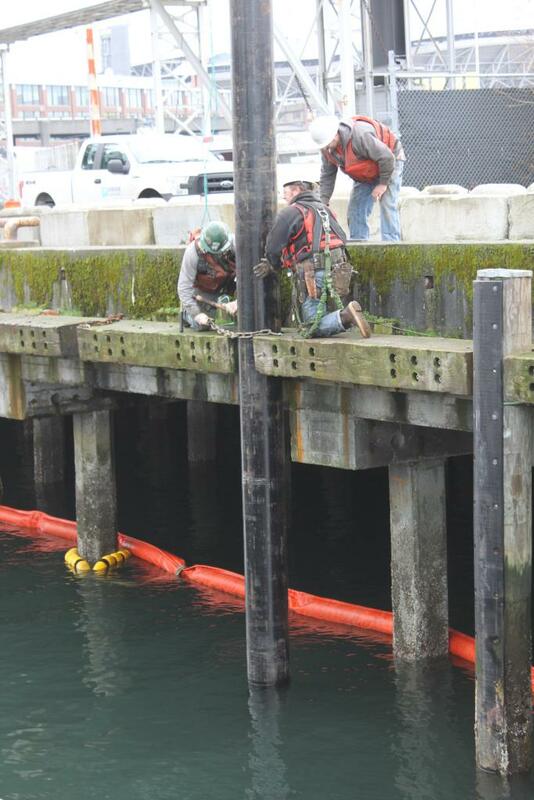 The pier’s fender piling had sustained significant damage from the capsizing barge. Global’s team quickly developed and proposed a repair plan. Once approved, Global removed the damaged fender piling and drove new steel replacements. 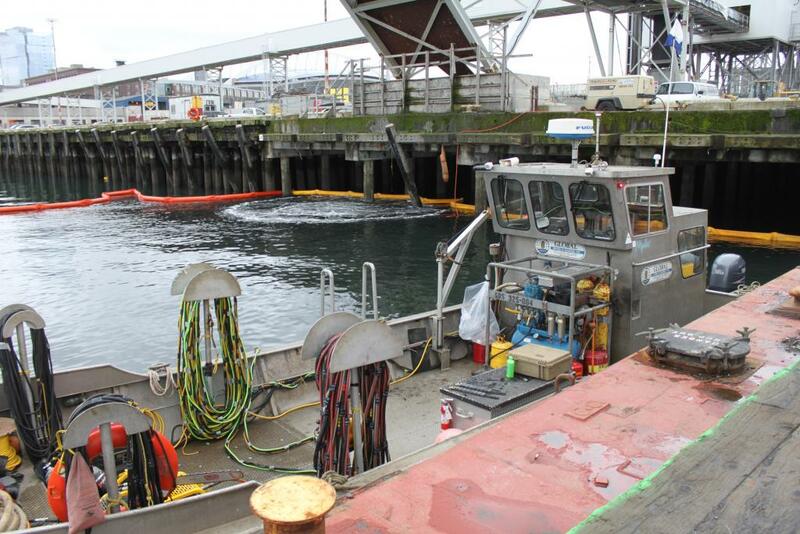 A new fender system was also required before barge loading operations could resume. Global’s team designed and installed the fender system allowing tunneling operations to resume. Resolving this unusual incident required a true collaborative effort between Global’s service lines — salvage, environmental, and marine construction.